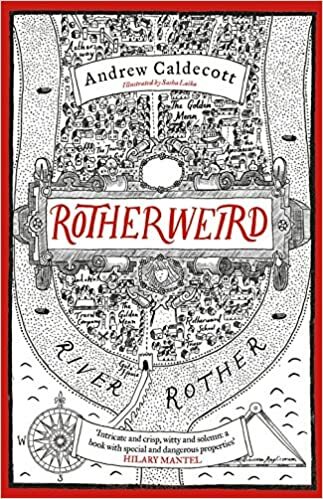 The mysterious town of Rotherweird lies cut off from the rest of England, independent but ignorant of its own past–a past which includes a set of exiled Tudor genius kids as founders. A new history teacher is hired at the Rotherweird school at the same time as its ancient manor is bought by a shady new owner, and things start getting very strange indeed. Summing up any more of the intricate plot is difficult without giving spoilers, so instead I’ll try to talk abou the feel of the novel. It has a light and whimsical touch that almost reminded me of the Harry Potter novels, but with subject matter that seems straight out of vintage Bradbury (I was thinking in particular of The Illustrated Man). I suppose you could classify Rotherweird as a fantasy, but I think it’ll find a place on my shelves with my “soft” science fiction. That is, there’s nothing to indicate that the fantastical events in the book are anything by natural, scientific phenomena–quite the opposite, actually, as Rotherweird’s thick crop of geniuses bring their various expertise to bear on the strange secret at the heart of the town’s independence. The book itself is gorgeous to hold, with a brilliantly executed cartographic cover and illustrations that capture the playful energy of the text. I’m looking forward to reading the sequel, Wyntertide, which was recently released.